Many of us feel at a loss when a friend or family member wants to share a story about a challenge or heart-ache they are dealing with. We feel we need to offer helpful advice, or at least say something profound. Truth is, the ‘medicine’ of listening with presence, an open heart and an open mind is the most healing gift we can offer! Compassionate Listening operates from the premise that each of us already has the wisdom to find our way to the next step; a good listener provides a mirror that enables the other to connect with the inner guide. This Intensive will provide you with skills and practice so you can do just that. In addition, we all need support for dealing with challenges, conflict and difficulty in relationships….whether at work, at home, or in the community. This week-end will provide many opportunities for delving into these. Through a series of structured exercises designed to help you understand the root cause and underlying needs in these situations, your understandings will deepen and ways for resolution will emerge. Come with an open heart, willing to share your stories and practice new skills with a small group of dedicated learners and listeners. 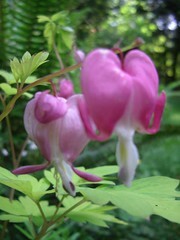 Sacred Groves is a unique, healing place, ideal for doing this heart-opening work. The schedule includes opportunities to walk quietly in the woods, letting mother nature help you integrate what you are learning. There are options for staying overnight in the healing beauty of the Groves. Lodging options are limited and assigned on a first-come, first served basis. We ask $40/person/night for a shared room or cabin, which includes breakfast. Depending on demand, we may have a private room available for $75. Pre-registration and a deposit is required. To confirm your intention to attend, please make a $100 deposit on-line by clicking the “Buy Now” button and using PayPal or your credit card. If you prefer to send a check, please write it to Sacred Groves and send to 9255 Holly Farm Lane, Bainbridge Is, WA 98110. THANK YOU! “This weekend was way beyond words. Your holding and facilitating, your humor and wisdom, as well as holding space awareness for the group was a very fruitful soil for what came to me this morning. This morning my awareness to things around me grew and I could see a tree without words or conceprts, looking from my heart’s expansion and wisdom. I think that the experience I had in Mendoza showed me a sign in my road journey, and what is possible and ahead for me. Your workshop provided me with a first space toward that endless awareness I need to grow into. Sometimes I feel, in my journey, like a young wizard that discovers she has magic she did not know about, and does not know what to do with, as well as, scared of the responsibility for the powers the magic holds. I hope I did not misused the powers of my growing awareness this weekend, and did not confused other group members in the process. “I can honestly say that this workshop changed my life. I learned a new set of skills that I will carry with me for the rest of my life. Therese is an incredible teacher and facilitator. The energy in her beautiful space is so welcoming and open. The group of attendees grew very close over the two days. We learned practical listening and communication skills, which we put into practice in small group exercises. Just by listening to one another we saw our feeling of connection and compassion for each other grow. We found that in our culture we don’t often just listen or on the flip side – really feel heard. Its a very powerful and moving practice. I’ve started using what I learned and I’m already seeing the results. I’m having a deeper connection with the people around me and a more loving and compassionate sense of self! We all need tools – and these tools are essential to living a connected and deeply fulfilling life!” –Lindsay M.
The Compassionate Listening Project (TCLP) is a non-profit organization dedicated to inspiring and empowering individuals to strive for peace through the cultivation and practice of powerful listening skills. 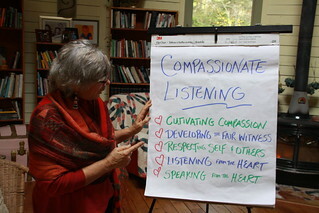 Therese is a Certified Facilitator with The Compassionate Listening Project and chair of TCLP’s Board of Directors. She has been integrating its tools and teachings into her community healing work since 2002. She believes that Compassionate Listening can help us find our way to reconciliation and understanding in our challenging relationships, re-weaving our families and communities.